IMPORTANT NOTE: This device can be updated in the future via internet from 2016 and up. JLR VAS connects directly to the vehicle OBD-II diagnostic port and powers from the vehicle. Then it's instantly ready to use. Additionally, Total Car Diagnostics will provide you lifetime internet updates for free. Each update will include new car models, but also extra functions. 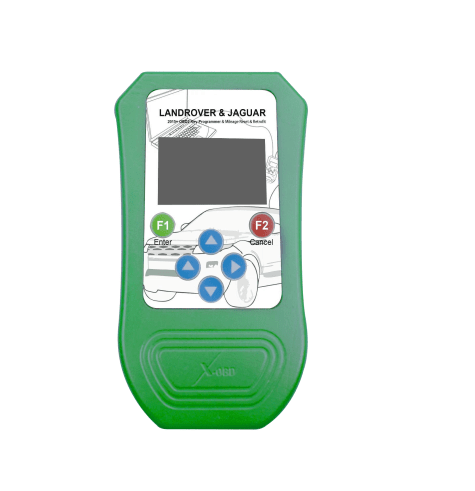 The handy X-OBD JLR programming device is developed for programming additional original keys (All keys LOST are supported), odometer reset, Retrofit coding for upgrading your car specifications on new Land Rover / Jaguar (JLR) vehicles via OBD II. The device supports CAN based models from 2010 MY. For retrofit coding functions, this device will support Landrover Sports & autobiography 2013-2016 MY, and online upgrade for future functions are possible. Our company not only the production of xobd JLR VAS, Auto Diagnostic Scanner, OBD Diagnostic Scanner and other products. In order to better service for the automotive industry, will be updated to create new more powerful products every year. Key programming to 2015 (ALL KEY LOST support),The stand alone key programming device is developed for programming additional original keys into new Land Rover/Jaguar (JLR) vehicles via OBD II even if all keys are lost. The device supports CAN based models from 2010 MY. The programming of the key is made for 45 seconds if there are no errors in air transmitting of the signal from the intelligent key to the car and if there are errors then the programming may take about 55 seconds after repeat some steps from the programming procedure and you can program maximum 8 keys in the car immobilizer memory. We would like to let our customers know that this device is our own production and it is not the same device sold by other companies from Lebanon, China and etc. You can only get it throughout our distribution network! Our device doesn’t kill the car after programming but program them normally! The programming of the key is capable for 15 seconds if there are no errors in air transmitting of the signal from JLR VAS Tool the intelligent key to the car and if there are errors then the programming may take about 25 seconds after repeat some steps from the programming procedure, normally for one key programming finished 1-2 minutes to be needed for safety security reasons setup, and you can program maximum 8 keys in the car immobilizer memory. The programming of the key is capable for 15 seconds if there are no errors in air transmitting of the signal from the intelligent key to the car and if there are errors then the programming may take about 25 seconds after repeat some steps from the programming procedure, normally for one key programming finished 1-2 minutes to be needed for safety security reasons setup, and you can program maximum 8 keys in the car immobilizer memory. 1/ The JLR tool is great done quite a few sports and disco 4s and even the new sport 13reg onwards works a treat! The XOBD Service Hand Held for Jaguar and Land Rover. It connects directly to the vehicle OBDII diagnostic connector, powers from the vehicle and is then ready to use. Jaguar & Land Rover Vehicle Application List:Key Programming,Odometer Correction,Retrofit Coding Brake Systems,Service interval Reset, DTC Read & Clear, Oil Level Measurement, PDI - Pre Delivery Inspection, Transport Mode Toggle,KM/KM/ML Navi Languages Convert. there are no errors in air transmitting of the signal from the intelligent key to the car and if there are errors then the programming may take about 55 seconds after repeat some steps from the programming procedure and you can program maximum 8 keys in the car immobilizer memory. Moves the electronic park brake to the mount position and then releases the brake calipers. This item is intended for legal use for Professional Locksmiths only.